Wherever you are in your crochet journey, this free granny square pattern will help you learn to make this motif. It also points you to resources that you might need to expand upon the classic crochet granny square and take it to the next level. Many people use the term "granny square" to refer to any type of crocheted square. But a true granny square is what you'll learn in this tutorial. From here, there are lots of variations on this basic design. Work your classic crochet granny square in the round. You'll use double crochet stitches worked in clusters of three, with two chain stitches separating the sets. To crochet a granny square, all you need is yarn and a crochet hook. You can use any type of yarn at all and use any size crochet hook. For best results, use the crochet hook recommended for the weight of your yarn, information you can locate on the yarn label. An easy place to start is with a worsted weight yarn and a size H crochet hook. Begin with a slip knot on your crochet hook. 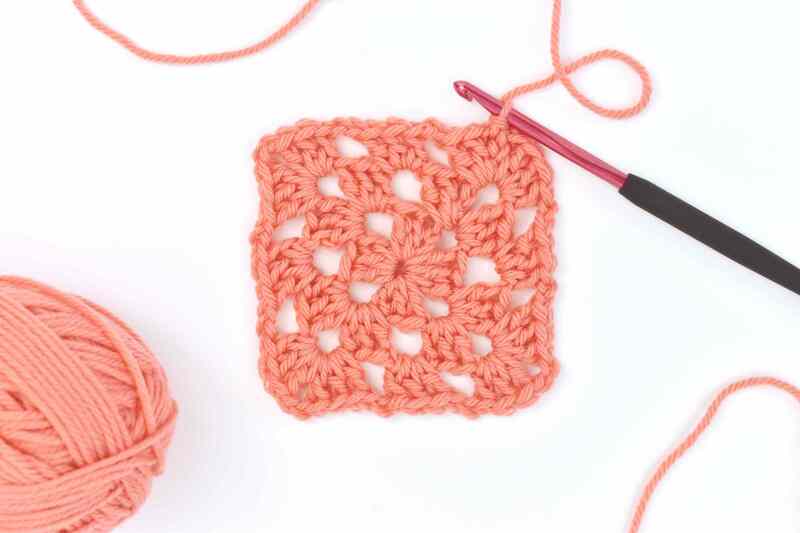 There are different options for starting a crochet granny square, but this method is the most common method and a good place to begin. Groups of dc stitches are the building blocks of crochet granny squares. Each set consists of three side-by-side double crochet stitches. The "chain 3" from the first step counts as the first double crochet stitch in the first cluster. To complete the cluster, crochet two dc stitches into the base chain of the chain three. You should now have what looks like three dc stitches next to each other in your first group. Make another cluster of three double crochet stitches. Crochet 3 dc stitches into the base of the first chain three (the same spot where you made the other double crochet stitches from the previous grouping) round. Repeat the previous step two more times. You should have four clusters of double crochet with a chain two space between each of them, and the last chain two hanging on the end. To close the round and create the square shape, slip stitch into the top of the first ch 3. This ends the first round. Sl st to top of ch 3 to close round. To start round two, and all other rounds, chain 3. As with the first round, this serves as the first double crochet of the very first set. Work 2 double crochet stitches right next to the chain 3 in the open corner immediately below the chain three. With the first dc cluster finished, chain 2. In the corner, crochet three double crochet stitches, chain two, and crochet another 3 double crochet stitches, all in the same spot in the corner. Work every corner of the granny square this way, except for the starting corner. Crochet around the granny square, repeating the previous step in each corner. When you reach the corner where you started, make another cluster of 3 dc stitches, then chain 2. Slip stitch to the top of the first chain three to close the round. The final corner should now look like all the others. Ch 3. 2 dc in same corner sp. Working in next corner sp: 3 dc, ch 2, 3 dc, ch 2. 3 dc in starting corner. Sl st to top of first ch 3 to close round. Begin the third round the same as the previous round. Chain 3, then make 2 dc stitches in the same space. Chain 2. In this round, crochet a cluster of 3 dc stitches in the space on the side of the square, then chain 2. Work into the corner the same way as the previous corners. Make a cluster of 3 dc stitches, chain 2, make another cluster, and chain 2. As you work your way around the granny square, repeat the previous steps so you get a cluster on each side and two clusters in each corner. When you reach the last corner, which was also the starting corner, make a cluster of dc stitches, chain 2, then slip stitch to close the round. 3 dc in next ch-2 sp. Ch 2. Repeat steps 2 and 3 twice. 3 dc in starting corner. Ch 2. To finish your granny square, you can cut the yarn, leaving a tail of at least six inches. Then, weave in the ends. You can also grow the granny square larger. With each round, you'll have more spaces and groups of dc along each edge. Keep adding them to grow the granny as big as you want! 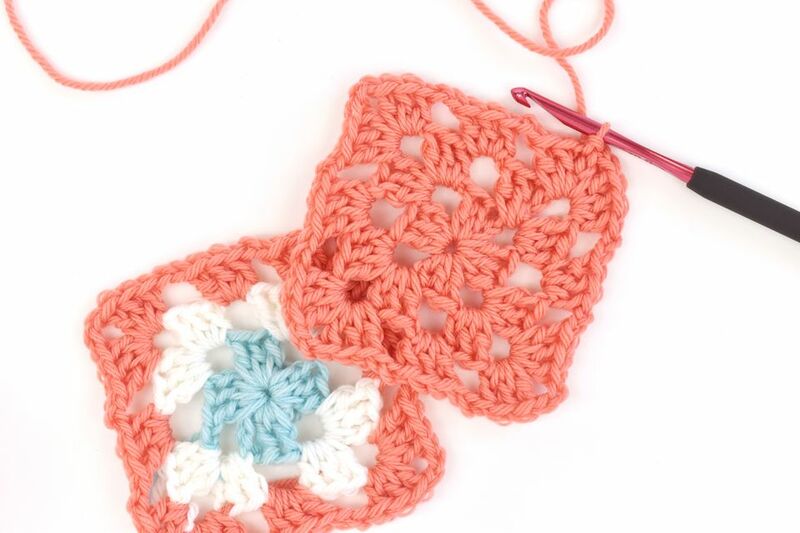 The instructions in this tutorial show how to make a classic crochet granny square in a single color. But once you know how to do that, you can take it further by ​changing colors in each round. Want to learn more about granny square crochet? Try these ideas! Use a ch-1 instead of a ch-2 for tighter squares. Try other small granny square variations that make a big impact! Add a crochet edging to the classic granny square. Make a crochet granny square project, such as a granny square blanket. To do this, you may also need to learn how to join granny squares. Learn other types of crochet square patterns. Learn how to crochet other granny shapes including the granny rectangle, granny triangle, and granny circle.